Bank of the Philippine Islands (BPI) prospers as one of today’s top and leading commercial banks in the Philippines with the celebration of its 160th anniversary this year. For 26 years now, its subsidiary BPI Family Savings Bank (BFSB) caters to middle-class families and offers superb retail banking products and services. Staying true to its promise of providing the perfect loan products that help families get started on their dreams, BFSB continues its initiative – the Auto Madness – to cater to us Filipinos in having our very own vehicles. The Auto Madness commenced 13 years ago in Cebu before becoming a nationwide event in 2009 after its tremendous success year after year. This 2011, BPI Family Auto Madness goes not only nationwide but also international, as it co-presents the 7th Manila International Auto Show (MIAS) on April 7-11 at the World Trade Center. It’s now bigger than ever! Why? The MIAS is the biggest auto show in the Philippines, having more than 24,000 square meters of exhibition space. There will be more than 25 participating automotive brands, special heritage displays, and the Car of the Year unveiling. If you book a car during the event, you’ll have a chance to win Php100,000 rebate on your car purchases. WOW! To make it more exciting to visit the MIAS, BPI brings back its FREE GPS Real Thrills Promo to complement brand new vehicles for personal use with a minimum amount financed of Php700,000 and a loan term of 36 months. In addition, car buyers will also get a free Petron-BPI MasterCard with free fuel and fuel rebates. 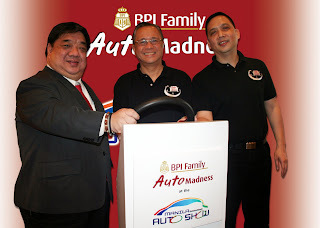 BPI Family Auto Madness will also be held at the Ayala Center in Cebu from April 1-3, 2011 and at the Lim Ket Kai Mall in Cagayan De Oro from April 4-16, 2011. For more details on getting a BPI Family Auto Loan, interested individuals can call (02) 845-6777 or visit www.bpiloans.com or any of the over 800 BPI or BPI Family Savings Bank branches throughout the country. BPI auto loans might very well be the best way for the emerging middle class to acquire vehicles. Filipinos don't usually earn enough money for a one-time payment of their car purchase. Some can do a one-time payment, but settles for loan so that the money can be placed somewhere else while paying off the loan.